today's post is from my lovely friend Deirdre at JDaniel4's Mom. she's been a bloggie friend of mine for over a year now, due to our connections through a variety of blogging networks. no matter what the forum, Deirdre always comes with inspiring ideas, fresh perspectives and a supportive spirit. I am truly honored to be sharing a craft my son and I did on Crayon Freckles. Crayon Freckles is one of my favorite places for visit. I want to thank Andie so much for giving me the opportunity to share it with you. 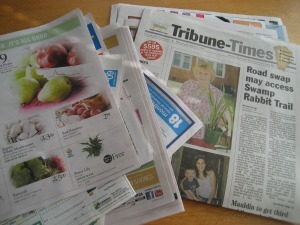 We actually look forward to getting our local newspaper every Wednesday at my house. It is fun to see that is going on in the community and what it on sale at the various grocery stores near us. Once I have looked the paper over, my son and I use it to craft. 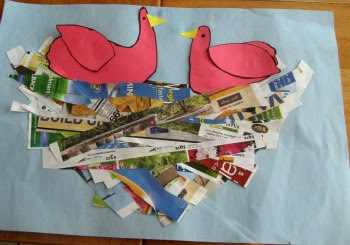 Newspaper and store circulars make wonderful crafting material Recently used the paper to we made a preschool craft I am calling Making a Newspaper Nest. 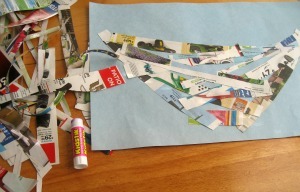 The nest is made simply of strips of newspaper and grocery store circulars cut into strips. The strips don't have to be cut in straight lines. They can be cut with jagged edges and unique bends. The nest will look more life like if the strips are not uniform. Cutting is one of the skills my son still needs to work on. I try to encourage holding the paper with one hand and cutting with the other to give his cutting hand some support. 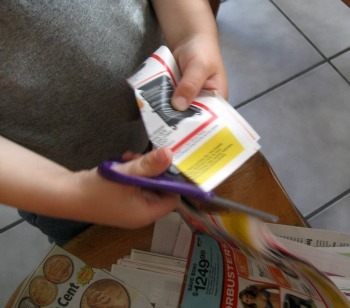 Once you have gathered a pile of newspaper strips, you can start to glue them onto a piece of construction paper. I confess that I glued down a few strips before my son did. 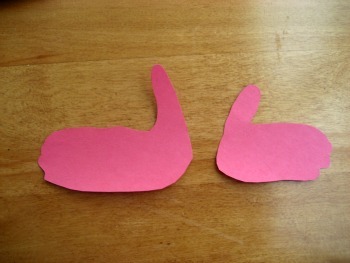 I wanted to create a bowl shape on the construction paper before my son started gluing. He didn't seem to mind. If you have child that does mind you ʺhelpingʺ with a craft, the nest would look just fine with strips glued down wherever they want them. The newspaper strips are just layered on top of each other until the area of the paper for the nest is covered. Some nests may end up with more paper than others. After we finished the nest, we decided the nest needed some birds in it. I traced my sons hand and he traced mine to make the bodies of two red birds. We later added a wing, beak, and eyeball to each of the birds. My son later mentioned that we should have added a worm. He felt the mama bird should have been feeding the baby bird. I think a worm will be added to this when my son gets a chance. Deirdre Smith writes/owns JDaniel4’s Mom. Her blog features ways she and her 5 year old are exploring learning, crafting, creating healthy meals and living life to its fullest. Deirdre can also be found on Twitter as @jdaniel4smom and on her blog's FB page. Thank you so much for letting me share this post!